Memories: While I don’t remember my 2nd Christmas I do remember this photo which was in the family photo albums…and is now in my photo collection. 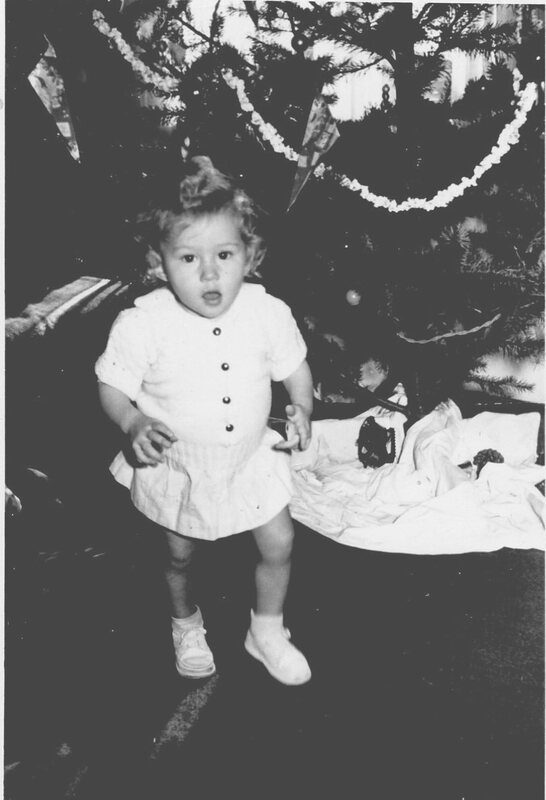 I have to smile….my mom loved to decorate the tree but often it was a unique look! Kimberly got sick and knit booties! No…it wasn’t cold…this photo was taken last year! Sharing some of her gifts. 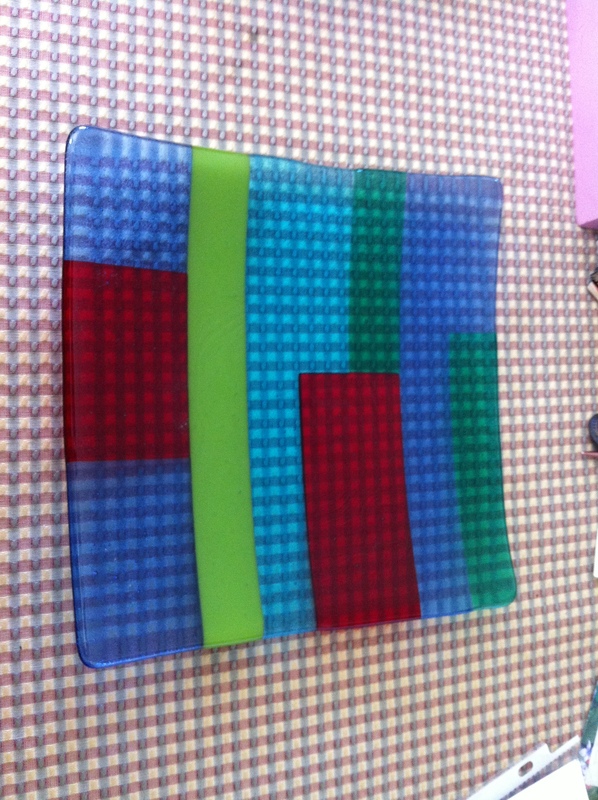 We have glass artists in our midst! 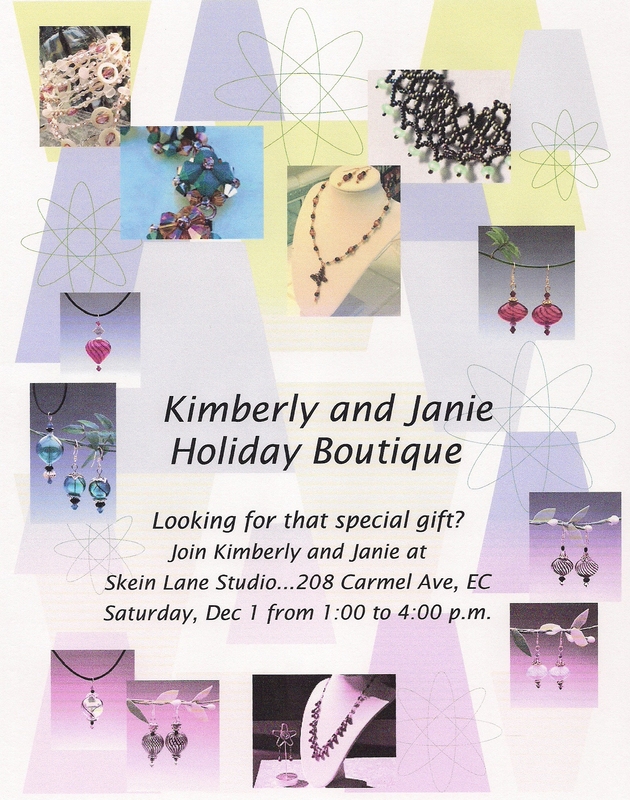 A few weeks ago Jan and Rachelle both brought their latest creations to share…….infused glass work. 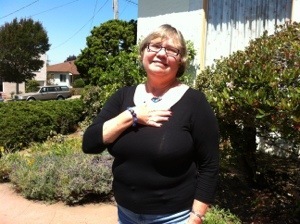 Just a few minutes later Jan arrived with her beautifully crafted infused glass jewelry….bracelet and necklace. We were all in awe. 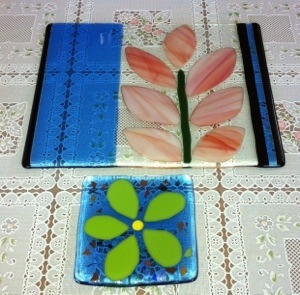 Jan introduced us to her glass creativity abilities last August when she showed one of her first pieces made in her class at Bulleyes Glass Co. She has made several since….I fear my camera didn’t capture many….darn it! 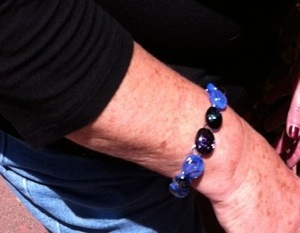 The last of today’s show and tell belongs to Rachelle. I saw this while helping pack moving boxes. 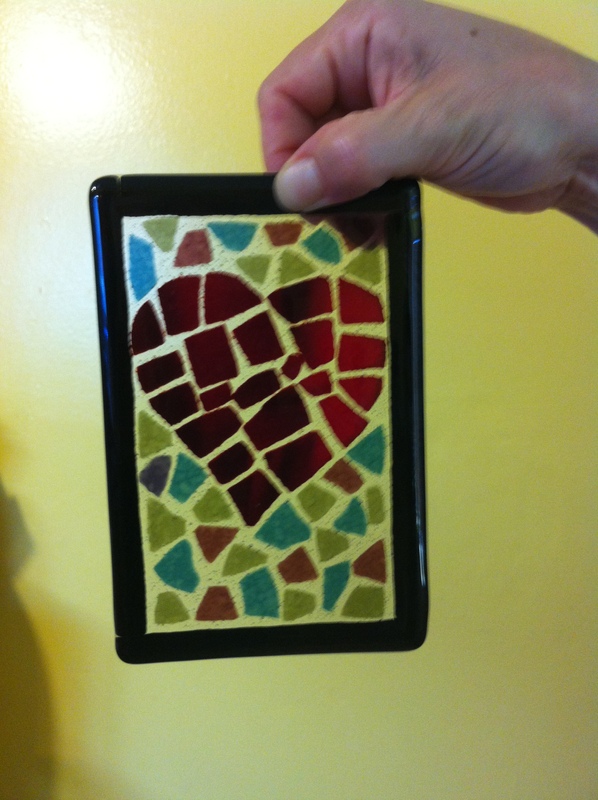 It was a recent creation! I save almost everything…my grammar school report cards, 1st bookmark I made for my mother, my autograph book from 5th grade….you would think I would have saved the program from the field trip to Fort Mason to the Norway Day Festival. 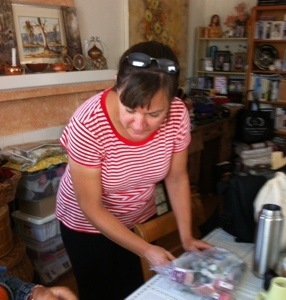 This was just last Sunday….where did I put the materials? Oh well….the power of the internet comes to the rescue! A few of us knitters and a spouse boarded Bart and headed to San Franciso ….we then hopped onto a Muni-bus…..rode to the last stop on that line….then trekked for a distance from Bay St to Pope passing Aquatic Park on our right. 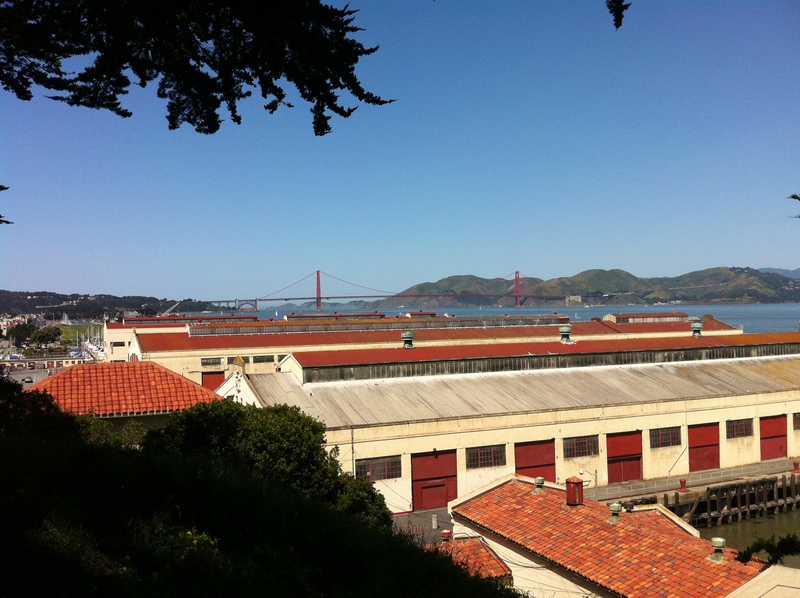 It was a lovely hike and majestic to see the Golden Gate Bridge come into view. 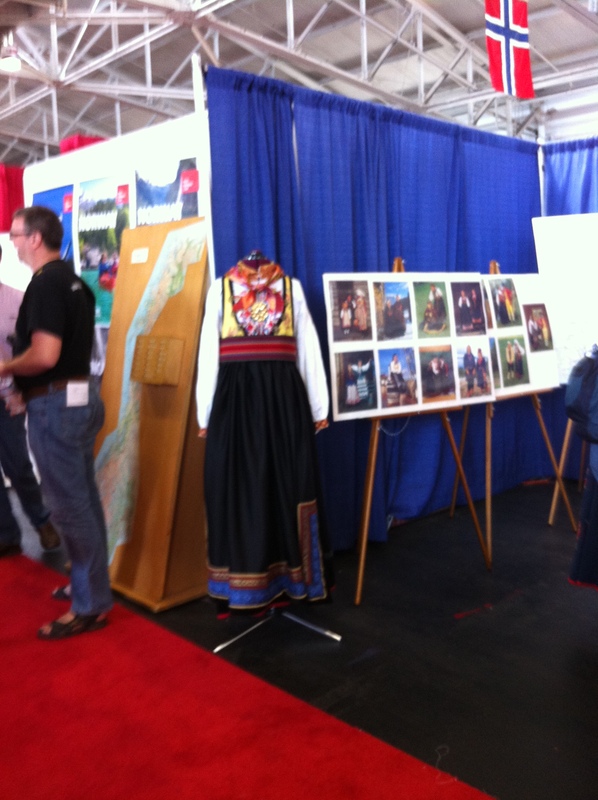 We walked a little further until we came upon the staircase that would take us down to Pier Level to Fort Mason….and there it was…the 20th Norway Day Festival. 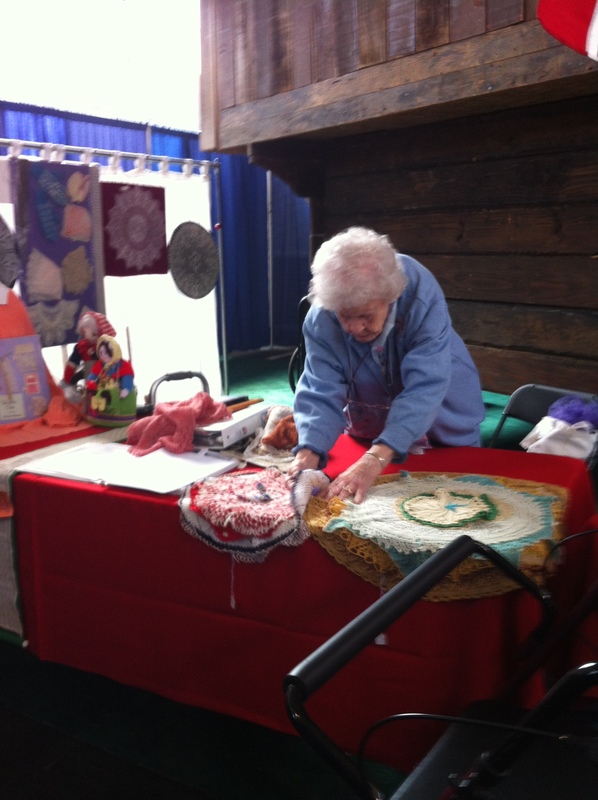 Guess what drew us to the festival…yep it was knitting! 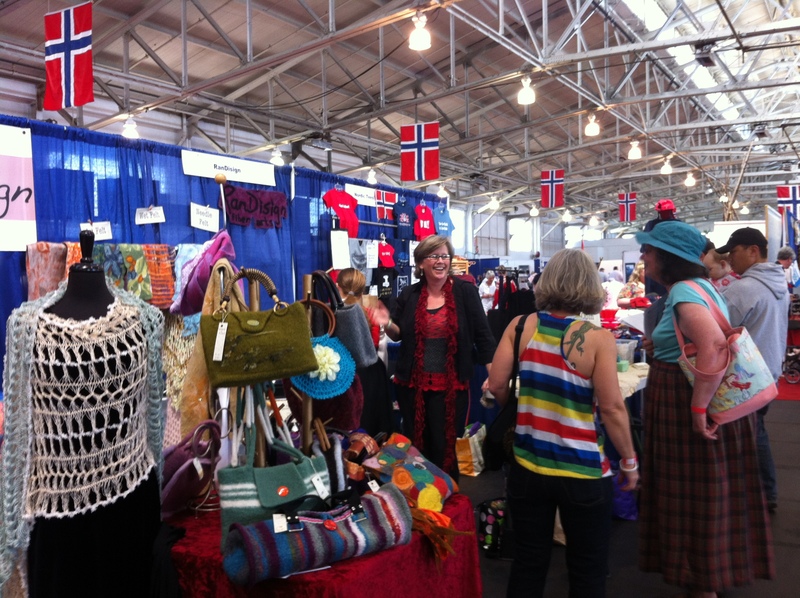 One of the first vendors we saw was the Lacy Knitters Guild – Spindles and Flyers. 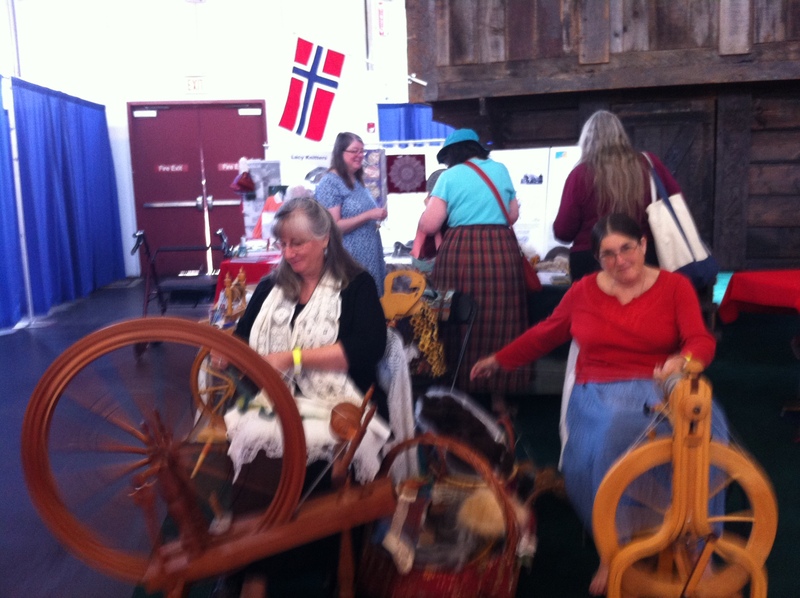 The spinners were comfortably seated…spinning. 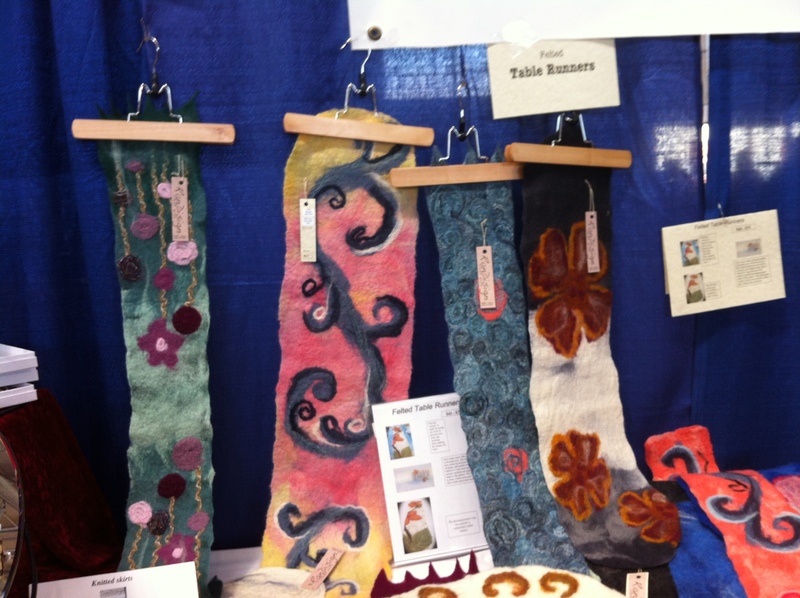 In the background was a woman of 90 arranging knitted works….one of which was knit by her grandmother from an original rayon. This is a bit of family history that I would love to have explored! 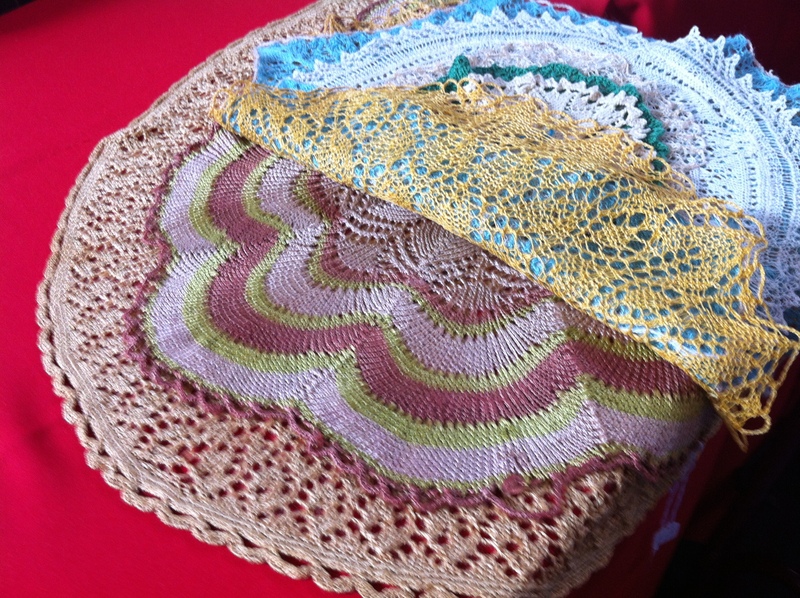 Display knit piece with original rayon! 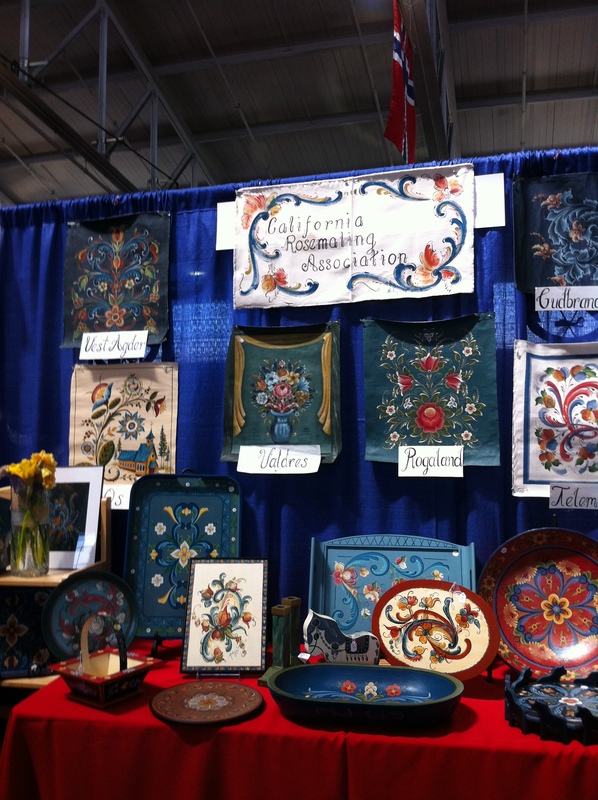 We began walking up the first aisle of two…and we were quickly taken with so many visual wonders. 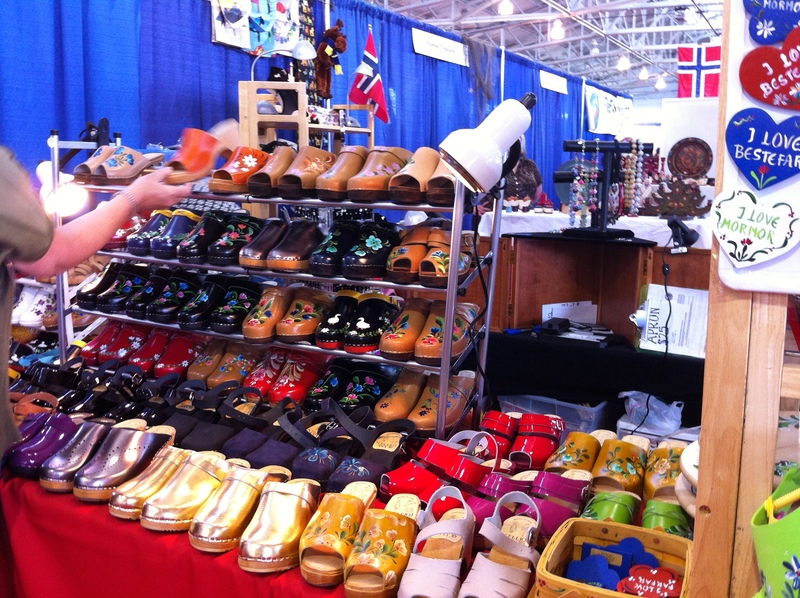 The Norwegian arts are bright and inviting. 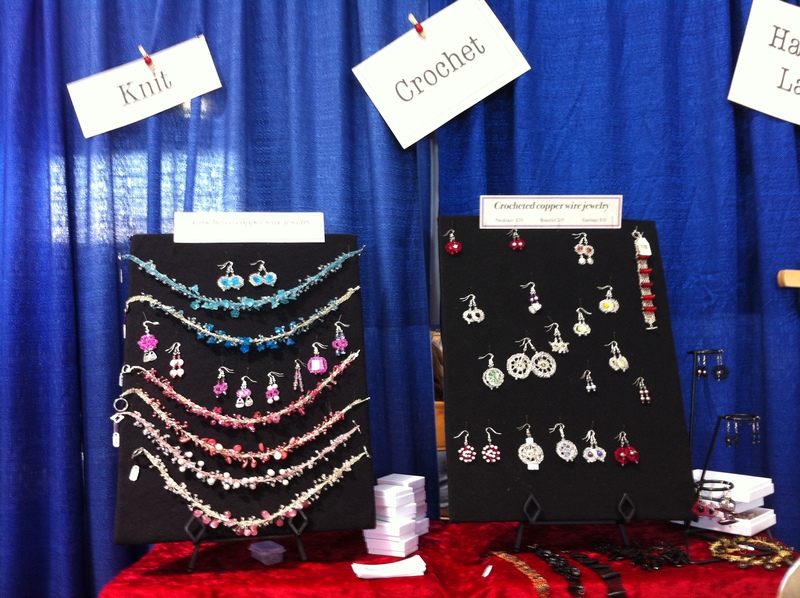 We stopped at RanDisign booth which was stocked with knitted and felted wonders as well as beautiful crocheted jewelry. 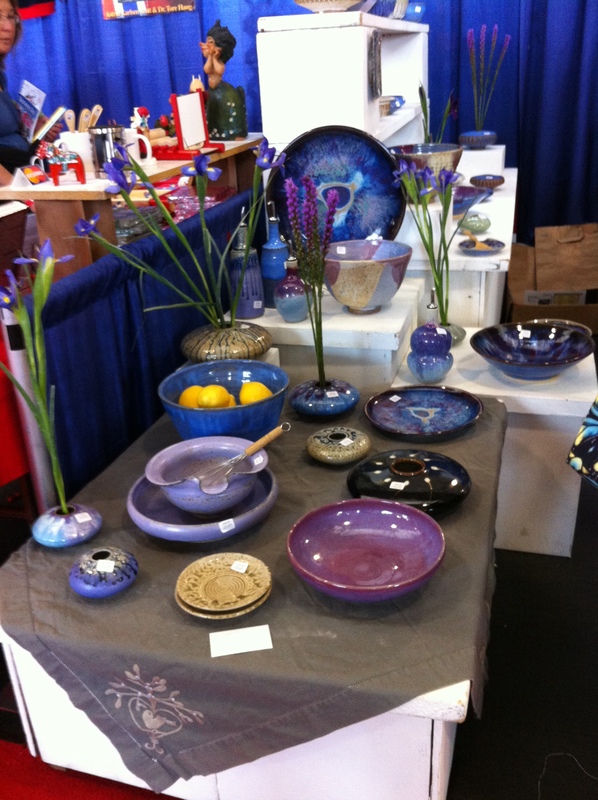 One of the next booths of visual delight was Viking Pottery….I love pottery.. if I had more rooms or even space in existing rooms I would have brought something(s) home from this booth. I first chatted with the woman in the booth…assuming that she was artist and that she was accompanied by the man next to her…..wrong he was the artist and she was accompanying him. 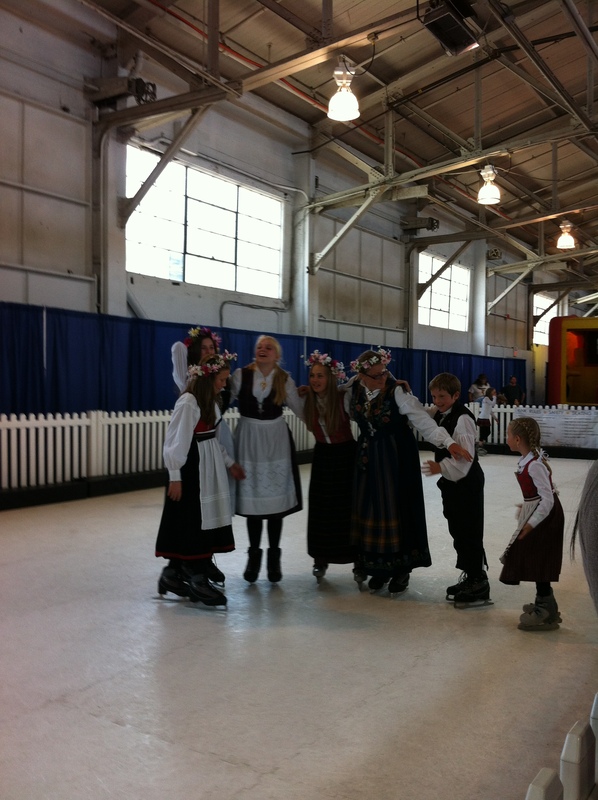 At random some of the other delights included the tole work, the painted clogs, the Norweigan dress, the skaters…. 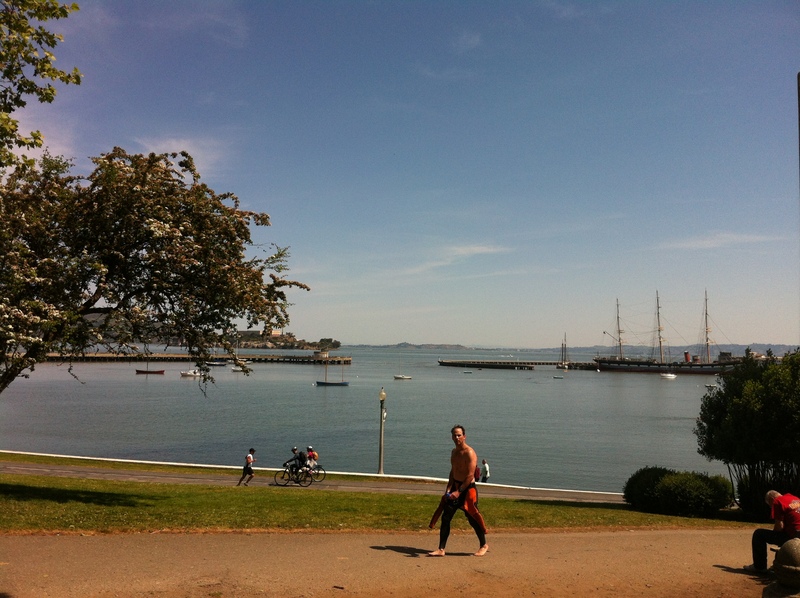 ….now I was off to a “movie” break in the Festival. The rest of the gang was doing their personal tour…the joy of such friendships is that we can travel at our own pace and meet back to share our discoveries. Will be back in the morning with the conclusion to this wonderful adventure!